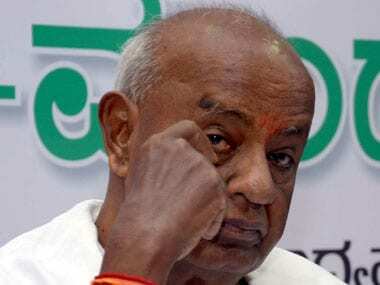 Bengaluru: JD(S) supremo HD Deve Gowda said on Monday he had offered to support a Congress-led government in Karnataka after the fractured verdict in the Assembly polls but the latter insisted on HD Kumaraswamy becoming the chief minister. Gowda said during his hour-long discussion with senior Congress leaders Ghulam Nabi Azad and Ashok Gehlot, he was told that the decision to back his son Kumaraswamy for the post of the chief minister was taken by the Congress high-command. "There was a discussion between me, Congress leaders Ghulam Nabi Azad and Ashok Gehlot. I told them, you f orm (the government), I have no problem. They insisted that Kumaraswamy become the chief minister and that it was their high-command's decision," the former prime minister told a press conference. Amid reports of continued differences in the newly-formed JD(S)-Congress coalition over portfolio allocation and farm loan waiver, which has delayed the expansion of the Kumaraswamy ministry, Gowda indicated it would be difficult to keep the promise of relief to farmers. "How? With 37 members (MLAs of the JDS), we have to run the government with the support of another party. We will also have to continue with their programmes. Without their support it is difficult. "That is why he (Kumaraswamy) said I will give resignation, if need be. He was under Congress' will and not under the will of 6.5 crore people. He has called himself a child of circumstances," he said. Kumaraswamy had promised to write off farm loans totalling Rs 53,000 c rore within 24 hours of coming to power, but has now sought time citing coalition compulsions and the need to assess the financial condition of the state. The BJP has appealed to farmers and all sections of society to observe a state-wide bandh today to protest Kumaraswamy's failure to honour his promise of loan waiver. "Yesterday, he (Kumaraswamy) said with pain that he was under Congress' will and not under the will of 6.5 crore people...who has rewarded him for his fight?" Gowda asked. Kumaraswamy had on Sunday said he was at the "mercy" of the Congress and not the 6.5 crore people of Karnataka as his party had not received the full mandate which it had sought. Karnataka Congress leaders as also Kumaraswamy are in the national capital for discussions on portfolio allocation, and reports said there were differences among them on who should get key ministries, including the fin ance ministry. When asked about Kumaraswamy's earlier statement that he would form the government with those who agree to implement the JD(S) manifesto, Gowda said,"Discussions are going on. What can be done when finance ministry is not given (to his party)." "It is left to them...Congress is a major party, we are a minor partner. We did not ask for power, they themselves came. I said make someone from Congress the chief minister, I will support. There is no hiding this. I am not after power," Gowda said in response to a question about whether the Congress was not supporting Kumaraswamy's good decisions. Gowda termed as "low level" the speech by the Leader of the Opposition in the Assembly BS Yeddyurappa ahead of the trust vote sought by Kumaraswamy. "I saw the proceedings on TV. As a common man I'm saying, I have not seen such low-level speech," he added. Calling the JD(S)-Congress alliance &q uot;unholy", Yeddyurappa had attacked the Gowda family, saying, "The father and sons will finish the Congress".